If you’re looking for some super fun, easy crafts to do with kids, I’ve got 7 new ideas for you to try. There’s never a reason for kids to be bored with such a variety of things to craft at home. Homemade Slime: Have you ever tried making your own homemade slime? It’s so much fun for kids! All you need is a few household supplies (who knew liquid starch was such a versatile staple for home?) and a place to make a crafty mess and you’re on your way! Nickelodeon has nothing on you. Have you ever thought about making your own homemade soap? It’s so much easier than you think! No need to be intimidated about this old craft that’s making a comeback. And you can take control of the ingredients if you’re prone to allergies or sensitivities to regular soap ingredients. Making glittery, confetti heart art is a craft even the littlest of kids can do with minimal adult supervision. Perfect framed as a gift for loved ones or to keep at home. Yet another creative idea to recycle those tin cans from your kitchen: a recycled desk caddy covered in aesthetically pleasing cork and hand painted polka-dots will never go out of style. Perfect gift for Father’s Day or Mother’s Day! There are so many uses for the potato stamp. Make different shapes and use to make birthday invitations, stationery, custom stamped paper napkins for holiday parties, and on and on. Have fun making up your own uses! Don’t waste your old t-shirts! Very minimal sewing skills are required to make your own recycled t-shirt bag – no one will ever know if you sewed in a straight line or not! Cut up an old, holey t-shirt to make a re-usable grocery bag to take to the weekend farmer’s market. 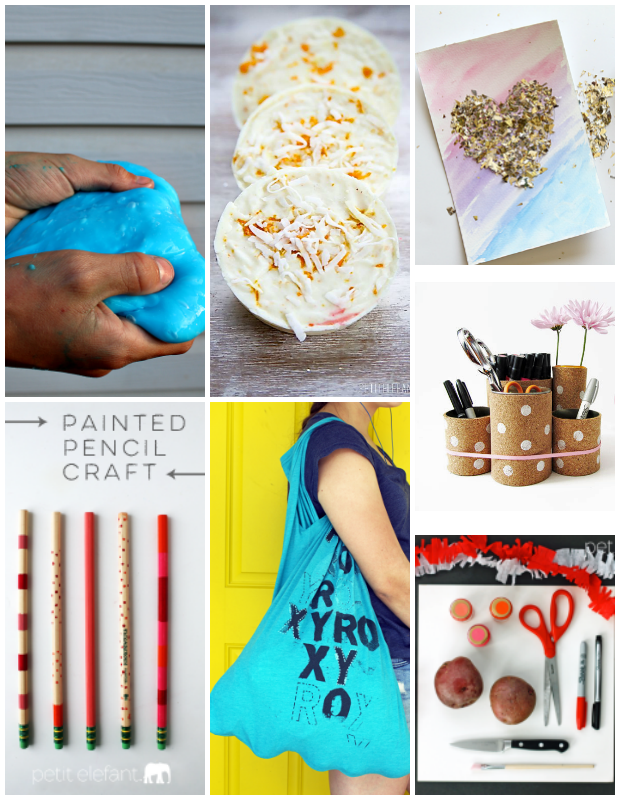 Whip up some personalized wood pencils using stamps, toll paint and washi tape. Perfect for a gift for friends, back-to-school or grandparents. Check out the crafts below. Just click on the links to head to each of these awesome crafts.